"The MG's" redirects here. For the album, see The MG's (album). 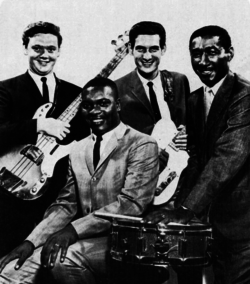 Booker T. & the M.G's c. 1967: Booker T. Jones (seated) and (left to right) Donald "Duck" Dunn, Steve Cropper, Al Jackson Jr. The band was inducted into the Rock and Roll Hall of Fame in 1992, the Musicians Hall of Fame and Museum in Nashville, Tennessee, in 2008, and the Memphis Music Hall of Fame in 2012. Having two white members (Cropper and Dunn), Booker T. & the M.G. 's was one of the first racially integrated rock groups, at a time when soul music and the Memphis music scene in particular were generally considered the preserve of black culture. The first track from the band's debut album. The tempo, tone and technique of "Green Onions" make it one of the most recognized soul instrumentals. Booker T. & the M.G. 's formed as the house band of Stax Records, providing backing music for numerous singers, including Wilson Pickett and Otis Redding. In summer 1962, 17-year-old keyboardist Booker T. Jones, 20-year-old guitarist Steve Cropper, and two seasoned players, bassist Lewie Steinberg and drummer Al Jackson Jr. (the latter making his debut with the company) were in the Memphis studio to back the former Sun Records star Billy Lee Riley. During downtime, the four started playing around with a bluesy organ riff. Jim Stewart, the president of Stax Records, was in the control booth. He liked what he heard, and he recorded it. Cropper remembered a riff that Jones had come up with weeks earlier, and before long they had a second track. Stewart wanted to release the single with the first track, "Behave Yourself", as the A-side and the second track as the B-side. Cropper and radio disc jockeys thought otherwise; soon, Stax released Booker T. & the M.G. 's' "Green Onions" backed with "Behave Yourself". In conversation with BBC Radio 2's Johnnie Walker, on his show broadcast on September 7, 2008, Cropper recalled that the record became an instant success when DJ Reuben Washington, at Memphis radio station WLOK, played it four times in succession, before the track or even the band had a name. The single went to number 1 on the US Billboard R&B chart and number 3 on the pop chart. It sold over one million copies and was certified a gold disc. It has been used in numerous movies and trailers, including a pivotal scene in the motion picture American Graffiti. Later in 1962, the band released an all-instrumental album, Green Onions. Aside from the title track, a "sequel" ("Mo' Onions") and "Behave Yourself", the album consisted of instrumental covers of popular hits. Booker T. & the M.G. 's continued to issue instrumental singles and albums throughout the 1960s. The group was a successful recording combo in its own right, but most of the work by the musicians in the band during this period was as the core of the de facto house band at Stax Records. Members of Booker T. & the M.G. 's (often, but not always, performing as a unit) performed as the studio backing band for Otis Redding, Sam & Dave, Albert King, Johnnie Taylor, Eddie Floyd, the Staple Singers, Wilson Pickett, Delaney & Bonnie and many others in the 1960s. They played on hundreds of records, including classics like "Walking the Dog", "Hold On, I'm Comin'" (on which the multi-instrumentalist Jones played tuba over Donald "Duck" Dunn's bass line), "Soul Man", "Who's Making Love", "I've Been Loving You Too Long (To Stop Now)", and "Try a Little Tenderness", among others. Along with their counterparts in Detroit, Motown's Funk Brothers, as a backing band to numerous hits, they are considered to have originated much of the sound of soul music—particularly, in the case of the M.G. 's, Southern soul—in which "the groove" is paramount. In the mid-1960s Jones was often away from Memphis while studying music full-time at Indiana University. Stax writer and producer Isaac Hayes usually stepped in when Jones was unavailable for session work, and on several sessions Jones and Hayes played together with one on organ, the other on piano. However, Hayes was never a regular member of the M.G. 's, and Jones played on all the records credited to Booker T. & the M.G. 's, with one exception: the 1965 hit "Boot-Leg", a studio jam with Hayes playing keyboards in Jones's place. According to Cropper, it had been recorded with the intention of releasing it under the name of the Mar-Keys (the name had sometimes been used on singles by the Stax house band). However, as recordings credited to Booker T. & the M.G. 's were meeting with greater commercial success than those credited to the Mar-Keys, the decision was made to credit "Boot-Leg" to Booker T. & the M.G. 's, even though Jones did not participate in the recording. Individual session credits notwithstanding, the Stax house band—Cropper, Jackson, Jones, and Steinberg, along with bassist Dunn (Cropper's bandmate in the Mar-Keys); keyboardist Isaac Hayes; and various horn players, most frequently Floyd Newman, Wayne Jackson and Andrew Love (the latter two later formed the Memphis Horns)—set a standard for soul music. Whereas the sign outside Detroit's pop-oriented Motown Records aptly read "Hitsville U.S.A.", the marquee outside of the converted movie theater where Stax was based proclaimed "Soulsville U.S.A."
Booker T. & the M.G. 's consistently issued singles from 1963 to 1965, but only a few made the charts, and none was as successful as "Green Onions". Their second album, Soul Dressing, was released in 1965. Whereas the Green Onions album contained mostly covers, every composition but one on Soul Dressing was an original. After contributing to that album, Steinberg left the group, and Dunn (who had played on previous Stax sessions) became the group's full-time bassist. During a tour when the band was in Los Angeles playing in a Stax Revue, an informal jam session with three of the M.G. 's was recorded in Hollywood in 1965, initiated by DJ Magnificent Montague who played congas. The resulting track, "Hole in the Wall", was issued by Pure Soul Music in October 1965 credited to the Packers with writing shared by Montague, Cropper, Jackson and Jones. The track reached number 43 on Billboard, and made the Top 30 on Cash Box. All other songs released by the Packers had no involvement from Booker T. & the M.G.'s. After a period of commercial decline, Booker T. & the M.G. 's finally returned to the Top 40 with the 1967 instrumental "Hip Hug-Her". It was the first single on which Jones played a Hammond B-3 organ, the instrument with which he is most closely associated (he used a Hammond M-3 on all of the earlier recordings, including "Green Onions"). The group also had a substantial hit with their cover of the Rascals' "Groovin'". Both tracks are included on their album Hip Hug-Her, released in the same year. In the spring of 1967, they joined a group of Stax artists billed as the "Stax/Volt Revue" on a European tour, in which they performed in their own right and backed the other acts. In June of that year, they appeared at the Monterey Pop Festival, playing their own set and then backing Otis Redding, alongside performers like Jimi Hendrix, Janis Joplin, the Who, and Jefferson Airplane. They were invited to perform at the Woodstock Festival in 1969, but drummer Jackson was worried about the helicopter needed to deliver them to the site, and so they decided not to play. The albums Doin' Our Thing and Soul Limbo were released in 1968. The track "Soul Limbo", featuring marimba by Terry Manning, was a hit (later used by the BBC as their theme for cricket coverage on both TV and, latterly, radio's Test Match Special), as was their version of "Hang 'Em High". In 1969, the band scored their second biggest hit with "Time Is Tight", from the soundtrack to the movie Up Tight!, scored by Jones, which reached #6 on the Billboard pop charts. In 1969, Dunn and Jones, in particular, had become admirers of the Beatles, especially their work on Abbey Road. The appreciation was mutual, as the Beatles had been musically influenced by the M.G.'s. John Lennon was a Stax fan, who fondly called the group "Book a Table and the Maitre d's" (in 1974, Lennon facetiously credited himself and his studio band as "Dr. Winston and Booker Table and the Maitre d's" on his original R&B-inspired instrumental, "Beef Jerky"). Paul McCartney, like Dunn, played bass melodically, without straying from the rhythm or the groove. In 1970, Lennon's wish was granted, in a sense, when Booker T. and the M.G. 's recorded McLemore Avenue (named for the street where Stax Records was located), on which they performed instrumental cover versions of thirteen of the songs on Abbey Road, condensing twelve of them into three medleys, and also included a cover of George Harrison's "Something". The album's front cover is a parody of the front cover of Abbey Road; the back cover, with the blurred image of a mini-skirted woman at the edge of the photo, also mirrors that of Abbey Road. In 1970 Booker T. & the M.G. 's sat in with Creedence Clearwater Revival (CCR) for a jam, and they were the opening act for that band's January 31 performance at the Oakland Coliseum, which was recorded for the CCR album The Concert. It has been suggested that John Fogerty's interest in putting a Hammond B-3 on the album Pendulum was an acknowledgement of Jones and the admiration the two bands had for each other. Booker T. and the M.G. 's released what would be their last Stax single, "Melting Pot", and their last Stax album, also called Melting Pot, in 1971. "Melting Pot"'s repetitive groove-oriented drumming, loping bass line, and tight rhythm guitar made it an underground hit popular in New York City block parties. The song has often been sampled by rappers and techno DJs. The full-length album version of the track is over eight minutes long and contains a passage (not included on the single) featuring some particularly powerful flourishes from Jones's Hammond B-3. Melting Pot also includes the tuneful Native American–influenced track "Fuquawi", which was also released on a single, coupled with "Jamaica This Morning" (see below). Before Melting Pot was recorded, Jones had already left Stax and moved to California, because he disliked the changes that had occurred under the label's new chairman Al Bell. Part of the album was recorded at The Record Plant in New York City, not the Stax Studio, because Jones did not want to record there and instead opted for a different sound, hence the change of studios and cities between MG's gigs. Like Jones, Cropper had also become unhappy with business affairs at Stax and soon left to open his own studio in Memphis. However, the rhythm section of Dunn and Jackson remained on at Stax and did session and production work. Jackson (who had been in Hi Records producer Willie Mitchell's band) played on and wrote many of Al Green's biggest hits. Without Jones, the group (billed simply as the MG's) released a "final" single, "Jamaica This Morning", in October 1971. It failed to chart, and the group name was retired for the time being. In 1973, Dunn and Stax session guitarist Bobby Manuel recruited Hammond B-3 organist Carson Whitsett to be part of a band that was to back Stefan Anderson, a promising new Stax artist. Al Jackson was later brought in. The project did not ultimately yield any results, but the rehearsals were promising, prompting Jackson and Dunn to reform the M.G.'s. This version of the band featured Whitsett in place of Jones, so it was billed as simply "the MG's". The 1973 album entitled The MG's, with Manuel and Whitsett replacing Cropper and Jones, was not commercially successful, though it was critically well received. Whitsett would go on to back Bobby "Blue" Bland, Little Milton, and Kathy Mattea, and his songs were recorded by Johnnie Taylor, Solomon Burke, B. B. King, Etta James, Conway Twitty, and Lorrie Morgan. Manuel would become a staple of the Memphis music scene, playing with everybody from Al Green to Albert King, and later founded HighStacks Records (the name being a tribute to both Stax and Hi Records). After a promising meeting in late September 1975, Jones and Cropper (who were now living in Los Angeles) and Jackson and Dunn (still in Memphis), decided to give each other three months to finish up all of their individual projects. They would then devote three years to what would be renamed Booker T. Jones & the Memphis Group. Nine days later (October 1), Al Jackson, the man Cropper would remember as "the greatest drummer to ever walk the earth", was murdered in his home. In the Fall of 1975, Al Bell tasked Stax Producer/Musician Terry Manning (who had worked on several of the MGs albums) with a project which involved taking songs previously recorded by the classic Booker T & The MGs lineup of Jones/Cropper/Dunn/Jackson, but which had never been completed or released. Manning found and performed post production in the Stax studios on 12 songs, and the album was released in the UK and France in 1976 as "Union Extended." The remaining three members and drummer Willie Hall (a session musician who had played on many Stax hits, such as Isaac Hayes's "Theme from Shaft") regrouped under their old name, Booker T. & the M.G. 's, and recorded the album Universal Language for Asylum Records in 1977. The album didn't meet with either commercial or critical success, and the band once again dissolved. Over the next decade, Cropper, Dunn and Jones remained active, producing, writing, and playing with other artists. All three joined Levon Helm, formerly the drummer of the Band, as part of his RCO All-Stars in 1977. Also in that year, Cropper and Dunn became part of the Blues Brothers band, appearing on the number-one album Briefcase Full of Blues. Cropper, Dunn and Hall also appeared in the 1980 movie The Blues Brothers, starring Dan Aykroyd and John Belushi. Cropper, Dunn and Hall later reprised their roles in Blues Brothers 2000. In 1980 the hit feature film The Blues Brothers featured Cropper, Dunn and Hall as part of the primary band backing the Blues Brothers. In 1986, former co-owner of Atlantic Records Jerry Wexler asked the group to be the house band for Atlantic Records' 40th anniversary celebration. The night before the gig, Jones came down with food poisoning, so Paul Shaffer stepped in at the last minute. The earlier rehearsals (with Jones, Cropper, Dunn, and drummer Anton Fig of Shaffer's "World's Most Dangerous Band", featured on Late Night with David Letterman) went so well that the group decided to play some dates together. Over the next few years, they played together occasionally. In 1992, Bob Dylan asked Jones, Cropper, and Dunn to serve as the house band (with Jim Keltner on drums) for his "30th Anniversary Concert", commemorating his thirty years in the music business, at which they backed Dylan, Stevie Wonder, Johnny Cash, Eric Clapton, and George Harrison, among others. At the concert, Neil Young asked the group to back him on his 1993 world tour. Also in 1992, Booker T. & the M.G. 's were inducted into the Rock and Roll Hall of Fame. In 1993, Booker T. & the M.G. 's toured with Neil Young, backing him on his own compositions; the set list often included a cover of "(Sittin' On) The Dock of the Bay" (the original recording by Otis Redding had of course featured Booker T. & the M.G.'s). In 1994, the group recorded its first album in 17 years, That's the Way It Should Be. Steve Jordan was the drummer on most tracks. In 1995, when the Rock and Roll Hall of Fame opened its museum in Cleveland, Ohio, the M.G. 's served as the house band for the opening ceremonies, playing behind Aretha Franklin, Sam Moore, John Fogerty, and Al Green, as well as performing themselves. Jones, Dunn, and Al Jackson's cousin, drummer Steve Potts, backed Neil Young on his 2002 album Are You Passionate?. Cropper, along with Isaac Hayes and Sam Moore, welcomed Stax president Jim Stewart into the Rock and Roll Hall of Fame in 2002. Cropper and Hayes were later inducted into the Songwriters Hall of Fame. Booker T. & the M.G. 's, usually with Steve Potts on drums, still play select dates. They have been called the most influential stylists in modern American music. In early 2008 they backed singer Guy Sebastian on a sold-out tour of Australia. In 2004, Rolling Stone ranked the group #93 on their list of the 100 Greatest Artists of All Time, and in 2007, the group received the Grammy Lifetime Achievement Award. 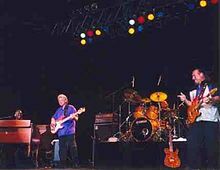 Also in 2004, Eric Clapton featured Jones, Cropper and Dunn as the house band for the first "Crossroads Guitar Festival" a two-day event held at the Cotton Bowl in Dallas, featuring outstanding performers in various musical genres who play guitar as their primary instrument. A two-disc DVD of the show was released in the same year. Jones, in collaboration with the band Drive-By Truckers, released the album Potato Hole, featuring Neil Young on guitar, in 2009. He released The Road from Memphis in 2011; the album won a Grammy Award. On May 13, 2012, Dunn died following two concerts in Tokyo. For many years, Stax publicity releases stated that the initials in the band's name stood for "Memphis Group", not the MG sports car. However, this has proved not to be the case. Musician and record producer Chips Moman, who worked at Stax Records when the band was formed, claimed that the band was named after his sports car, and only after he left the label did Stax's publicity department declare that "M.G." stood for "Memphis Group". Moman had played with Jones and Steinberg in an earlier Stax backing group called the Triumphs, which was also named after his car. Jones, in a 2007 interview on National Public Radio's Fresh Air with Terry Gross, confirmed Moman's account of the origin of the group's name. Jones has re-confirmed this story on several occasions since, most recently as a guest on the Late Show with David Letterman on May 9, 2012. October 1965 "Hole In The Wall"
(as The Packers) "Go 'Head On"
July 1966 "My Sweet Potato" "Booker-Loo" Stax 196 85 18 — — And Now! October 1971 "Jamaica This Morning"
Note: Through a period between late 1963 and early 1965, Billboard magazine did not publish an R&B singles chart. R&B chart figures for this era are from Cashbox magazine. ^ a b "Booker T. and the MGS". History-of-rock.com. 1975-10-01. Archived from the original on 2012-01-26. Retrieved 2011-07-07. ^ "Booker T. and the M.G.'s". Archived from the original on 2008-05-04. Retrieved 2011-02-12. ^ Racial integration Benny Goodman led the racially integrated Benny Goodman Trio and Quartet a quarter-century prior, and other integrated jazz bands had existed since the 1930s. ^ a b Gilliland, John (1969). "Show 51 – The Soul Reformation: Phase three, soul music at the summit. [Part 7] : UNT Digital Library" (audio). Pop Chronicles. University of North Texas Libraries. ^ Murrells, Joseph (1978). The Book of Golden Discs (2nd ed.). London: Barrie and Jenkins. p. 143. ISBN 0-214-20512-6. ^ "Way Back Attack - The Packers". Waybackattack.com. Retrieved 28 October 2017. ^ Song "Time is Tight" soundtrack Up Tight! ^ "Booker T. & the MGs, Estelle Axton to be honored at 2007 Grammys". Archived from the original on 2007-09-29. Retrieved 2007-06-06. ^ "''Origin of band name declared as Memphis Group''". Funkydrummer.com. Archived from the original on 2011-10-19. Retrieved 2011-10-19. ^ Guralnick, Peter (2002) . Sweet Soul Music. Edinburgh: Canongate. p. 128. ISBN 978-1-84195-240-6. ^ Fresh Air from WHYY. "Booker T. Jones: A Life in Music". NPR. Retrieved 2011-07-07. ^ Simpson, Dave (11 March 2019). "How we made Booker T and the MGs' Green Onions". The Guardian. Retrieved 13 March 2019. "Booker T. and the M.G.'s". Rock and Roll Hall of Fame.